In this article we will learn about the Environment class of C#,which provides the machine configuration details,Program execution Environment details as well as some properties which is used to break the one line into new line which is written in the program for output. Let us learn the definition of array so beginners can also understand. What is Environment class ? 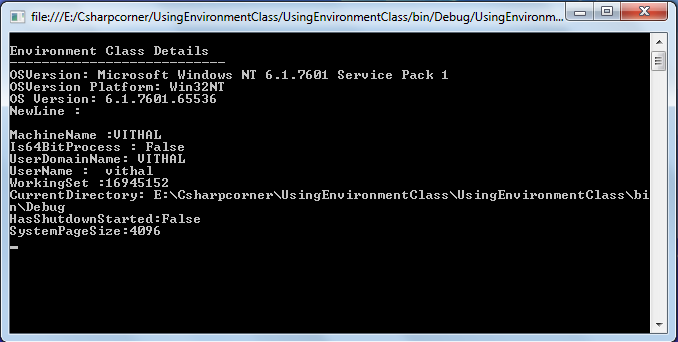 Environment class is static class which Provides the system configuration,Current program execution Environment as wel some properties for string manipulation such as news line,System Namespace represents the Environment Class. Environment class is a combination of functions and Properties which represent the Environment variable details using IDictionary in the form of key,value pairs. 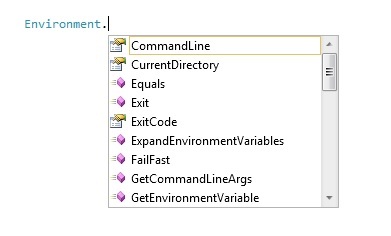 we can also loop through Dictionary to get all Environment variable details,before introducing all Environment variable,let us go through some frequently used Environment variable details. as we Environment class is the static class because of this we directly access the methods and properties with help of class name itself without creating object. As explained above defination ,Environment class is the static class which provides the some properties and function as you can see in the above Image. Environment.CurrentDirectory.ToString();//gets the full path of current working directory. 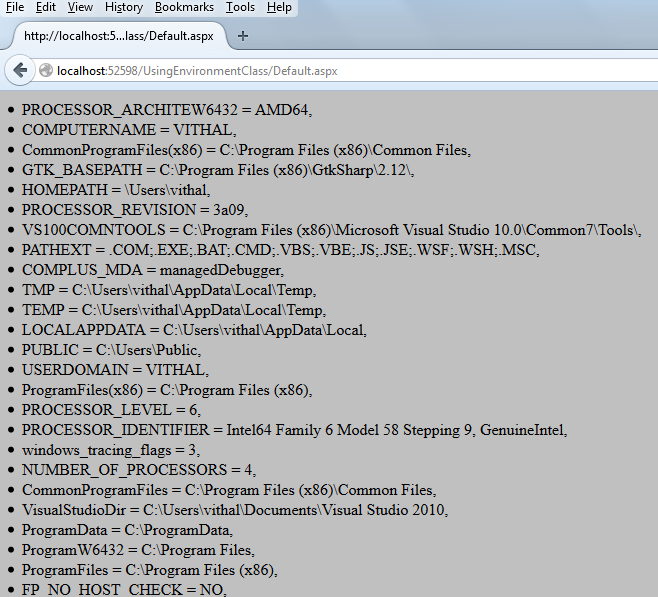 Environment.SystemPageSize.ToString();//gets the Amount of memory for an operating system's Page file. ar.Add("CurrentDirectory: " + Environment.CurrentDirectory.ToString());//gets the full path of current working directory. ar.Add("SystemPageSize:" + Environment.SystemPageSize.ToString());//gets the Amount of memory for an operating system's Page file. From the above output its also clear that Environment Variables details contains in the form of key -value pairs. In the preceding article, I have briefly explained the use of a Environment class to make them understandable to beginners and newcomers. If you have any suggestion regarding this article then please contact me.